Wednesday, 20 June 2012 - 1:10 pm. Tasmania Police has taken delivery of a high-tech ‘BearCat’ Armoured Rescue Vehicle (ARV). The $400,000 vehicle has been funded by the Commonweath Government as part of a National Counter-Terrorism Committee (NCTC) project to build Australia’s counter-terrorism capability. Each police jurisdiction will be supplied an Amoured Rescue Vehicle by the NCTC. Three States have already received vehicles and a further three jurisdictions including Tasmania Police are receiving an ARV this year. The 10 tonne BearCat, manufactured in the United States, is designed for use in high risk situations such as hostage incidents or acts of terrorism. 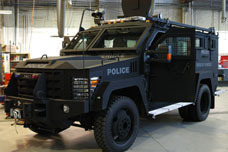 The vehicle is bullet and blast resistant, providing protection for police and other emergency service workers. It will also assist with the safe rescue of hostages or injured members of the community. Tasmania Police will undertake a number of preliminary tasks including registration for road use, maintenance and driver and operator training. As a consequence members of the community can expect to see the ARV on our roads from time to time, but should not be alarmed when they do so. The Bearcat will be allocated to the Tasmania Police Special Operations Group for use in high risk incidents. It is not intended to use the vehicle for general duties or patrols. The availability of an ARV will help provide safe resolutions for both the community and emergency responders and in many instances may result in the safer and quicker resolution of high risk incidents. This page -- https://www.police.tas.gov.au/news/armoured-rescue-vehicle/ -- was last published on June 20, 2012 by the Department of Police, Fire and Emergency Management.